Johann Wolfgang von Goethe – pronounced ‘gerter’ (1749-1832) is a German legend. 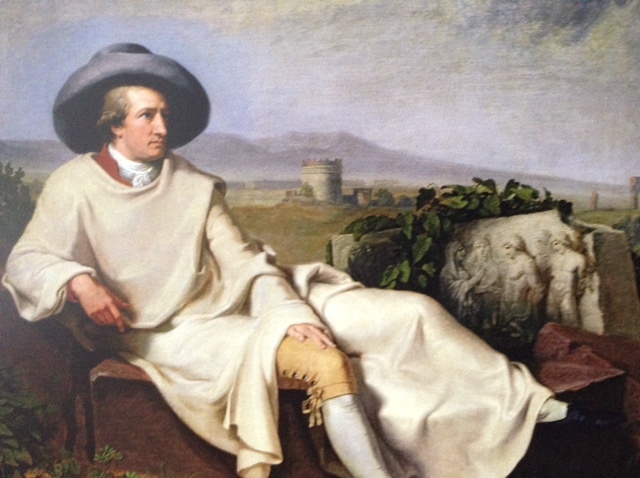 The learned Goethe did a lot in his lifetime – he was, by turns, a philosopher, novelist, botanist, anatomist, poet, dramatist and theatre director and if that wasn’t enough he was closely involved in the politics & court life of Weimar. But it doesn’t end there, he is also famous for fleeing to Italy, masquerading as a painter & enjoying an ‘Italian Journey’ which he vividly wrote about from 1786-1788. What an adventurer – no blogging, no mobiles, no credit cards, no FaceTime, no Facebook, no tweeting, just him, a trusty pen & parchment, and the desire to explore the classical world. From the German to the English the translation is quite perfect!